The Ward Hall Preservation Foundation is pleased to announce that Matthew J. Mosca of Baltimore has been selected to conduct a historic paint finishes study on the external surfaces of Ward Hall. The results of this study will be used to develop historic specifications for the restoration of Ward Hall. Matthew J. Mosca is a nationally recognized consultant in the field of historic paint research and restoration. He has over 40 years of experience in the field, focusing on identification of materials by microscopic and chemical means. He formerly worked for the National Trust for Historic Preservation and has served as an independent consultant since 1979. He has conducted complete research and restoration programs at nationally significant sites that have been recognized as major accomplishments by the American Institute of Architects, that National Park Service, and various other organizations. Previous locations of his paint research include Mount Vernon (VA), The United States Treasury Building (DC) and The Hermitage (TN). Funding for this project comes from the Kentucky Transportation Cabinet, as mitigation for the recent widening of US 460. The City of Georgetown will oversee the project and transfer of all funds. The foregoing is a press release prepared by the Ward Hall Preservation Foundation. 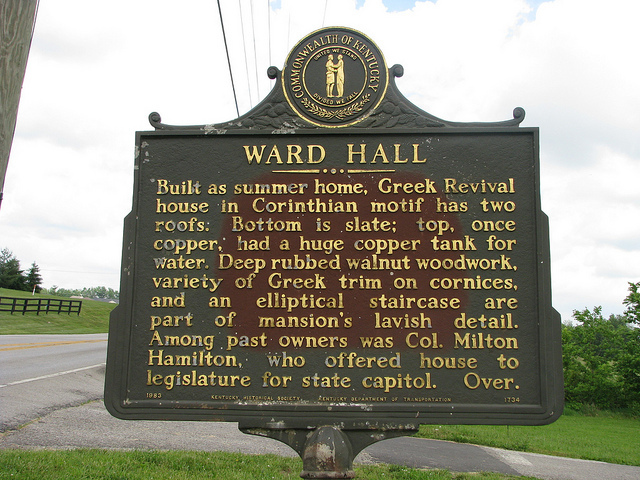 You can check out my earlier post on Ward Hall by clicking here.